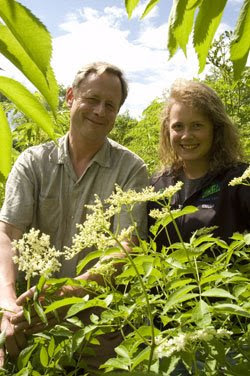 As his company’s name indicates, Hardie’s main business is bees, but bees need plants to pollinate, and crops such as elderberries fit the bill. He relates the growth of his apiary in slow cadences that recall the soothing tones of an undertaker but warm up, as he grows comfortable with his interlocutor, to something like a patient paternal figure. Founded 43 years ago, Honey Gardens grew from a hobby to a business when Hardie began to sell raw honey as a homegrown health aid. Health nuts who embraced raw foods in general touted Pooh Bear’s favorite as a cure-all, and Hardie is its number-one proponent. “You can use raw honey on wounds,” he says. “More and more people and hospitals are using raw honey.” As long as it’s kept below 120 degrees Fahrenheit — unlike the processed, filtered product in most stores — honey is a natural antiseptic. “It takes the air out of the wounds and brings to it a wealth of healing properties,” Hardie says.